Of all the different areas onboard, the cockpit is the one in which we spend the most time – having morning coffee, while underway, when entertaining guests, watching stars with evening cocktails. And though our cockpit is, by design, somewhat modest in size, it is perfect for the two of us. We exit out from below through a large, wide companionway that's covered by a very heavy, solid teak hatch, and teak double doors. Both of these areas have framed screen coverings that fold or swing out of the way. These screens are yet another feature original to the boat's design, that we've discovered other models completely overlook. There is also a groove for weatherboardsSet of stacking, fitted boards used in heavy weather to block seawater from entering the cabin., that have been stored away and never needed (so far, knock on teak). When we took possession of our HC33T, there were multiple colors of canvas throughout the exterior coverings; various shades of green, some maroon, and dark brown. Each companionway door had handy catch-alls hanging from them. So as I replaced the canvas with our chosen color of Spruce green Sunbrella®, I sewed new ones with pockets specifically sized for our gear. This is where we keep our padlock, binoculars, range finder, sailing gloves, clothespins, and other sundries that are often accessed on deck. 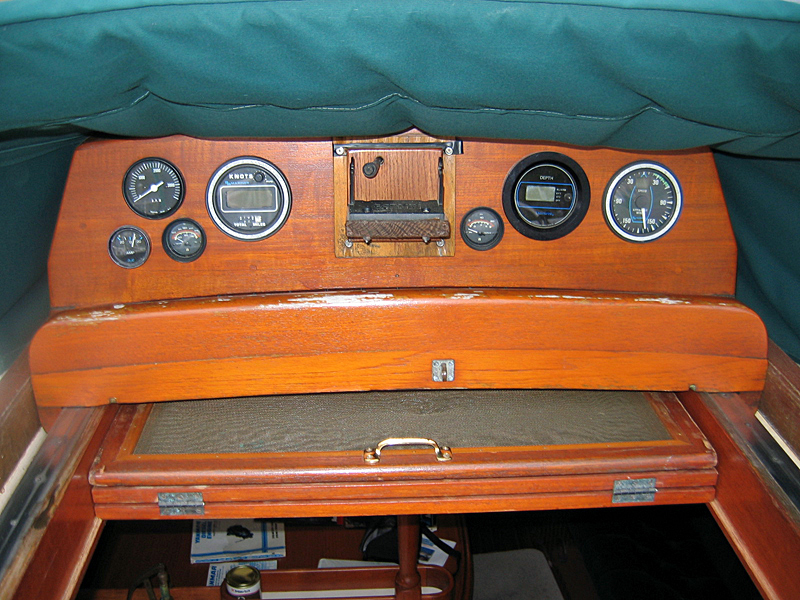 Looking back, a lot of changes have occurred on the small area directly above the companionway. Originally, the dodger was a short scoop of solid canvas. The flat vertical surface called the turtle, where some gauges are mounted was a real source of consternation for a very long time. All the instruments were old and no longer functioning. But each was mounted flush, meaning large holes had been bored into the thick teak. We couldn't figure out how we would deal with upgrades that were, of course, different diameters. Until it finally dawned on me to just cut a big rectangle out of the turtle, and screw on a slightly larger board to cover it. This makes it much easier for us to access wires, and mount the head units. When the time comes to change out the gauges, we can just replace the entire board. 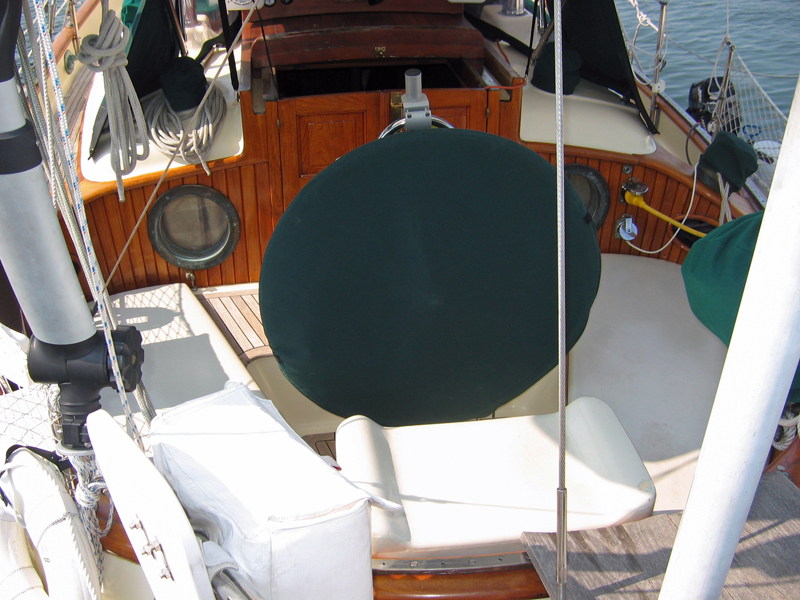 The companionway dodger has also been upgraded to a broader, higher scoop. Several, heavy vinyl windows are sewn in for visibility, and the forward panel rolls up for air flow. This covered scoop is a favorite place for Don and I to stand while watching rainstorms. We also have an additional, anchor awning that zips on to the open edge of the dodger, and hangs from a bar attached perpendicular to the backstayA cable that leads from the top of the mast to the stern, or back of the boat.. I have festooned this little space with a lot of useful decor; a green glass bug trap that I've knotted to look like an antique fishing net float, hanging herbs, solar fairy lights, a Moravian star candle holder, and a string of seashells that chime beautifully with our movements. We also have a set of led directional spotlights, and a set of Bazooka Tubbie double ended speakers that blast our tunes fore and aft, each on remote controls. Our cockpit is flush with a small, deep wellA recessed area on a boat. in the center that is mostly filled by our large, bronze binnacleA waist-high stand mounted in front of the helmsman, in which navigational instruments are mounted.. So we typically tread on the seats, which are covered in teak decking. The cockpit coamingA vertical surface designed to deflect seawater. is vertical shiplap teak. Between the deep gunwalesThe vertical wall between the top edge of the hull and the deck., large scuppersAn opening in the side walls for draining water., and high coaming, the cockpit usually remains very dry underway. 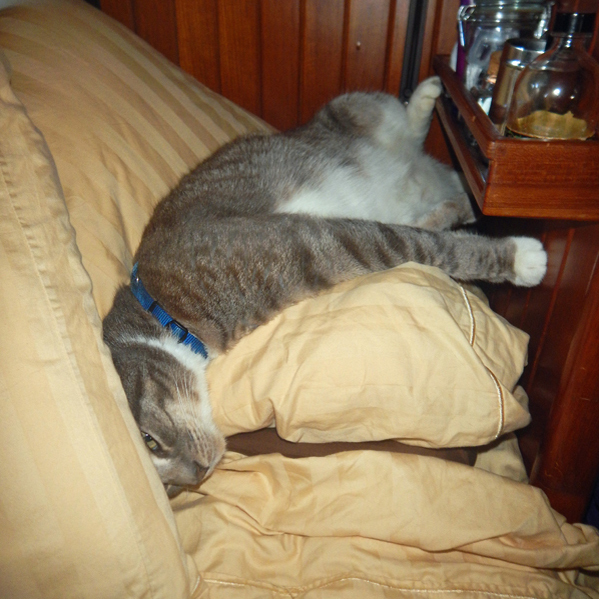 We've gone through several sets of cushions over the years. The original seating was covered in a very dark brown canvas that heated up to nuclear temperatures in the tropical sun. Those were soon replaced with white vinyl dipped foam. But the coating couldn't survive their constant use, and before long they were pitted, melted (from a grill mishap), and shabby. I covered them in cream Sunbrella, but eventually the foam split, cracked and molded. 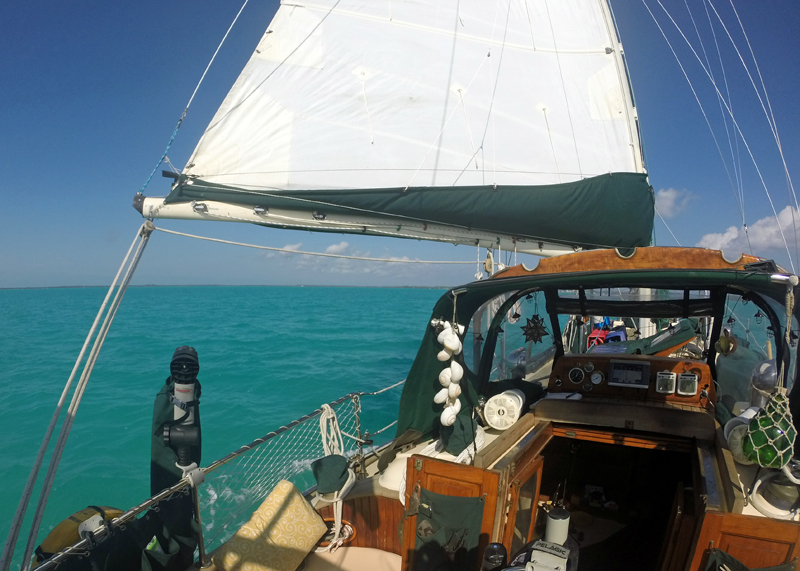 So before we left for a years long cruise through the Caribbean, I replaced the whole shebang; foam and coverings. We also have a pair of folding seats that provide nice back support while seated in the cockpit. They can be laid flat and used for sunbathing on the forward deck as well. Finally, we have a set of throw cushions that are 100% latex standard bed pillows. They are covered in waterproof cases inside of their canvas covers, and really come in handy when guests are onboard. 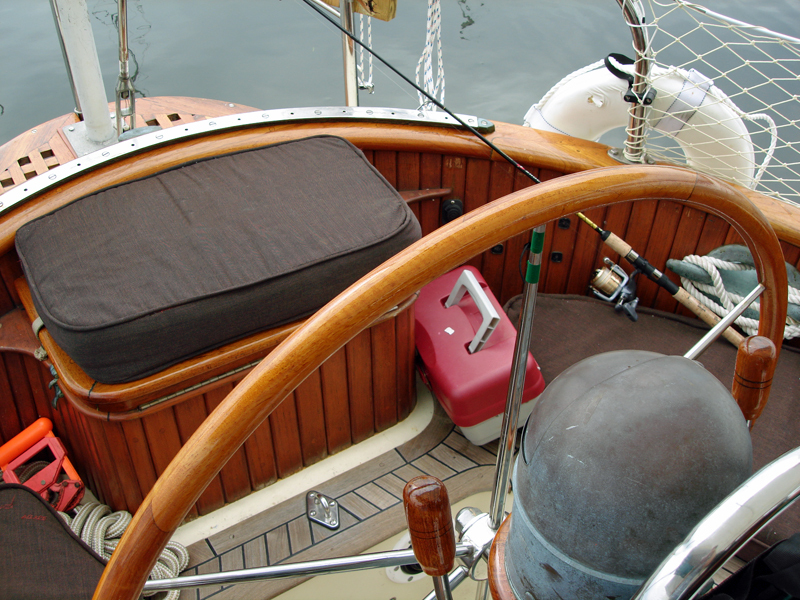 The highest, often most sought after seat is the helm. I've attached the foam saddle to the teak box with snaps, so it stays in place when the lid is lifted. 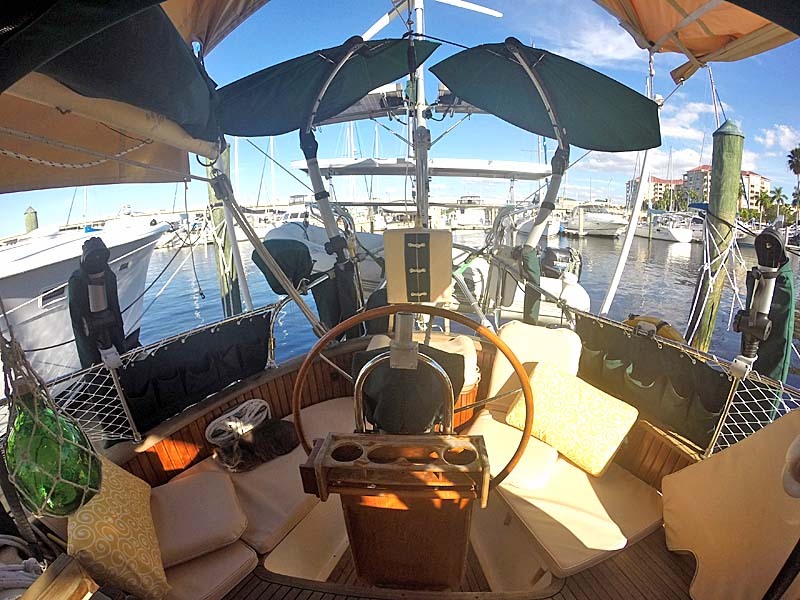 The rigging that runs behind the helm seat prevents us from installing a permanent back, so those throw pillows come in handy when we're seated there for any length of time. So far, they've not blown overboard, but I believe they will float if Poseidon ever tries to grab them. 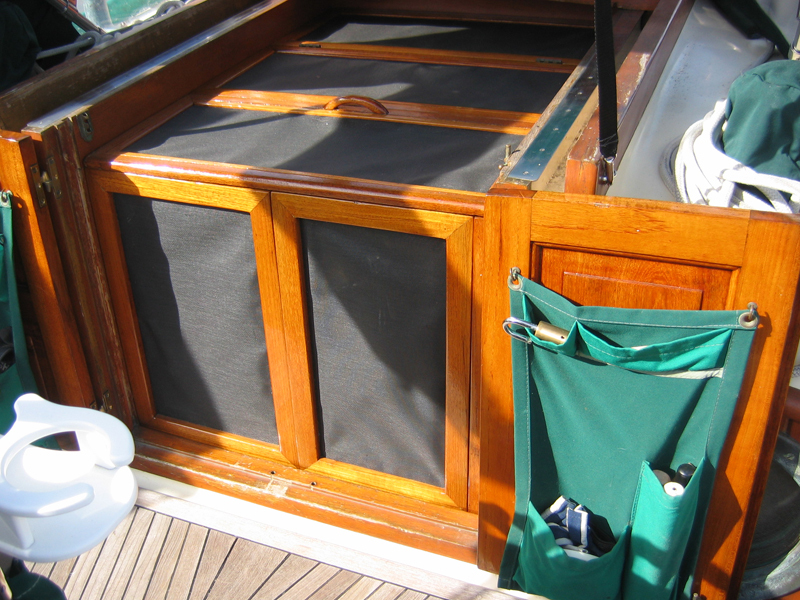 Two, rather deep open cubbies on either side of the companionway work out perfectly for keeping winch handles handy. But the largest area for storage onboard is found in our lazaretteA storage area near or aft of the cockpit on a boat. accessed via a large hatch that functions as the portLeft side of a ship when facing forward. side cockpit seat. It is fairly deep, and stores a whole lot of stuff; dock lines, fenders, beach chairs, even a set of house batteries. As I mentioned above, the helm seat also lifts open. Just inside is a large, built in shelf where our little Honda 2K generator fits like it was designed for the space. A small, propane locker is built in under the starboardRight side of a ship when facing forward. side seat. But it'd only take us about two weeks to burn through each of the two tanks that fit in the space, so we soon upgraded to one larger composite tank that hangs off the pushpitA small platform or railing off the stern, or back of a boat., and lasts us for months. The little, vacated locker now holds some safety gear, and the dinghy tow rope. Someday I'd like to install a built-in ice maker in that little space, so we'd have cold drinks handy. But I sadly, can not get Don to take me seriously on that project. Probably one of the best things I've sewn to date are the weather clothes that hang in front of the netting around the cockpit. I designed them to be rolled up and snapped in place should we want to allow breezes through, and included 5 big, deep pockets in each of them. They hold our electronic reading devices, water bottles, camera, satellite communicator – so many little doodads we want at hand that can't just be left rolling around while underway. These canvas shades provide us with privacy, and do a good job of keeping us from getting splashed by the occasional rouge waves that sometimes broadsides us. Like so many things onboard, the various items in our cockpit have evolved over the years of discovery in what we need, how we use it, and how it would best function. For example, I figured out to split the cockpit seat cushions when I made them, so we could clear the area on which we frequently step. And the accouterments under the dodger are hung with soft shackles so they can be easily removed when the going gets too rough. There was a time when I bemoaned our inability to cover our cockpit with a proper biminiA canvas or fiberglass top, and includes side wall enclosures for full weather protection.. But I've come to prefer having the open sky above. We've figured out ways to stay in the shade with fixed umbrellas, removable awnings, and large panels of fabric clipped up when needed. 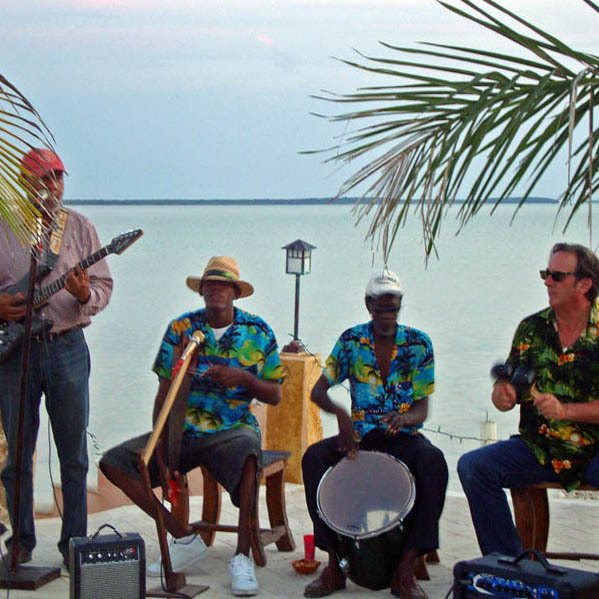 So as long as we continue to cruise in the warm, tropical latitudes – our little back porch does just fine. 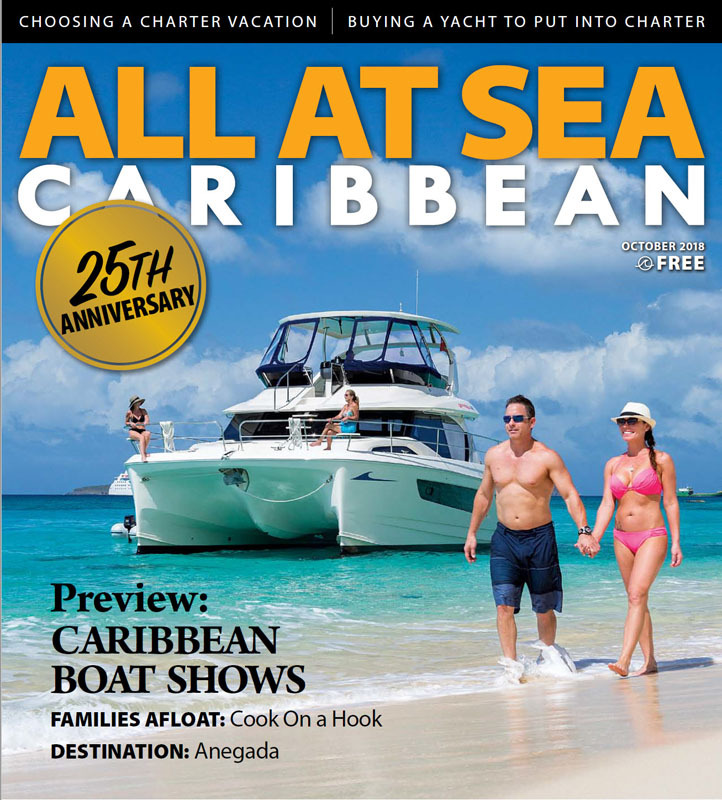 Check out our Boat Projects to learn more about our upgrades!